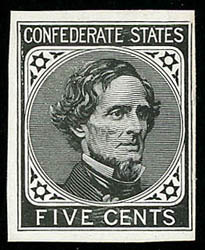 Confederacy, 1862, 5¢ black, De La Rue printing, trial color die proof on glazed card, full size 61x93mm, foxing, Fine and scarce full-size. Confederacy, 1862, 5¢ black, De La Rue printing, trial color die proof on glazed card, stamp size, bright and fresh, Very Fine and scarce. C.S.A. Catalog No. 6-TCDf $850. 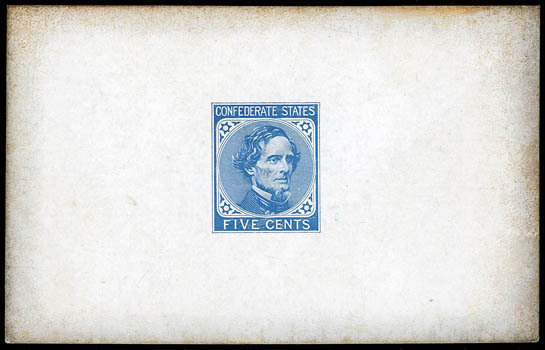 Confederacy, 1862, 5¢ light blue, De La Rue printing, large die proof on glazed card, full size 59x93mm, usual light edge foxing, otherwise Very Fine and scarce. 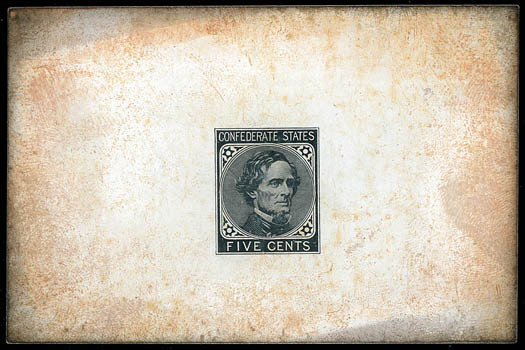 Confederacy, 1862, 5¢ light blue, De La Rue printing, plate proof on wove, vertical gutter pair, full margins, slight gutter crease as usual, Very Fine; signed in pencil by Robson Lowe on reverse. 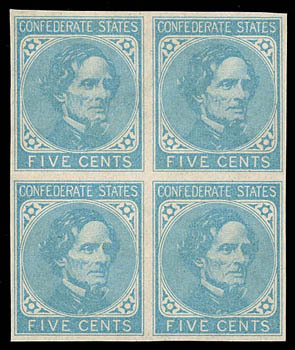 Confederacy, 1862, 5¢ light blue, De La Rue printing, plate proof on wove, block of four, full margins, Very Fine; signed in pencil by Robson Lowe on reverse. 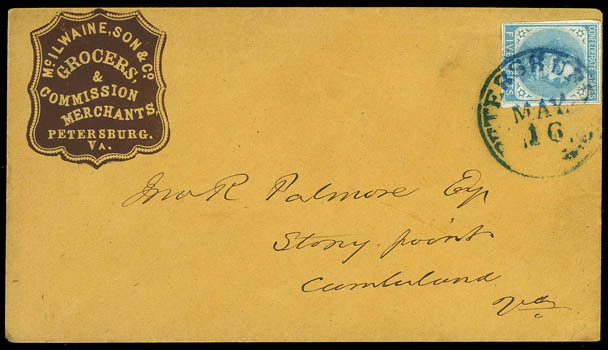 Confederacy, 1862, 5¢ light blue, De La Rue printing, tied by blue "Petersburg, Va., May 16" cds on fresh cover to Stony Point, Va., with brown embossed Mc.Ilwaine, Son & Co., Grocers & Commission Merchants cameo corner card at upper left, Very Fine and choice. Scott No. 6 Estimate $500 - 750. Confederacy, 1862, 5¢ light blue, De La Rue Printing, horizontal pair, margins to just touching, tied by "Houston Tex. Apr. 30" cds on blue adversity cover made from military broadside from Headquarters of Texas, New Mexico and Arizona, regarding blockade of Port of Sabine pass, addressed to Liberty Tex. 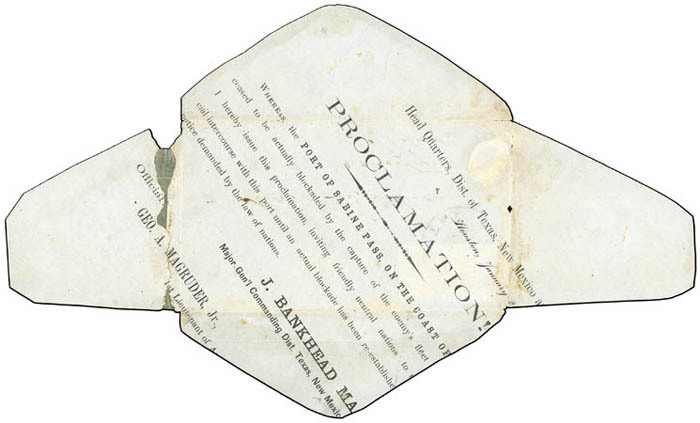 ; opened out for display with left flap hinged, small hole at bottom right mended with paper, Fine and desirable Texas adversity use. Scott No. 6 Estimate $400 - 600. 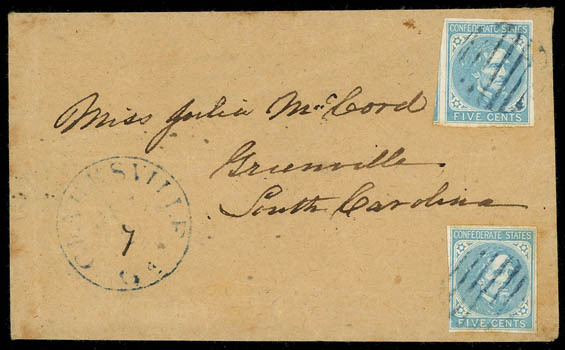 Confederacy, 1862, 5¢ light blue, De La Rue printing, two singles, tied by blue grid handstamps on fresh homemade cover to Greenville, S.C., matching "Clarksville, Ga., Jul 7" cds with manuscript day, notation under backflap reading "It is so true about poor Eddie. I have seen it in the paper. Oh Lord, how dreadful! 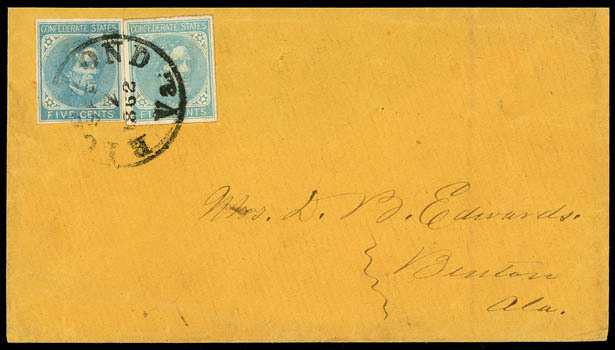 ", Very Fine, a rare color grid cancellation handstamp from Clarksville, Ga.
Scott No. 6 Estimate $300 - 400. 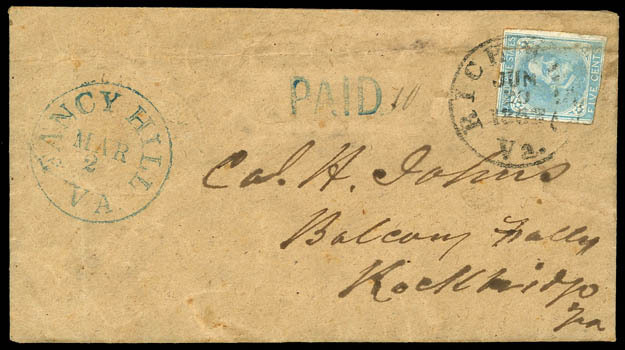 Confederacy, 1862, 5¢ light blue, De La Rue printing, creased, tied by "Richmond Va., Jun 20, 1863" cds on heavy brown cover with blind embossed corner card at left to Col. H. Johns at Balcony Falls Va., remailed with blue "Fancy Hill Va., Mar 2" cds and with "Paid" handstamp with manuscript "10" rating to same addressee, Fine and interesting use. 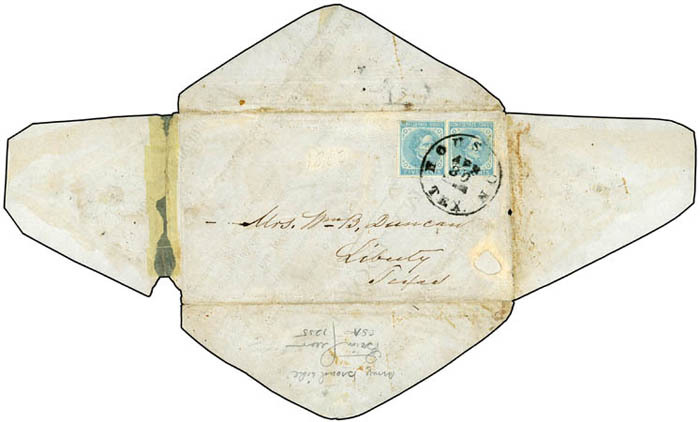 Confederacy, 1862, 5¢ light blue, De La Rue printing, right stamps in combination with 1862, 5¢ blue, Archer & Daly printing on thin De La Rue paper, tied by "Richmond, Va., Sep 7, 1862" cds on cover to Benton, Va.; missing backflap, Very Fine, a scarce combination. Scott No. 6+7 Estimate $100 - 150.